Ten years in Żarów - WSSE "INVEST-PARK". Wałbrzyska Specjalna Strefa Ekonomiczna "INVEST-PARK". YAGI Poland Factory is one of those companies that has been constantly developing thanks to its high-quality products accompanied by prime location and highly skilled personnel. Just within the last three years, the workforce of the Polish branch of the Japanese corporation has doubled. This April, the company is celebrating ten years of its functioning in the Wałbrzych Special Economic Zone. YAGI’s history dates back to 1914, when a firm producing farming tools was set up in Takasaki, Japan. Barely ten years later, the small company became Yagi Industries and produced parts for the automotive industry. Today, the company combines its hundred-year long experience with state-of-the-art technologies of metal processing and machining, which situates Yagi among the leading producers of car components. It mainly manufactures hub subassemblies and elements of air conditioning compressors, which are later installed in cars sold under various brands, such as Toyota, Nissan, VW and Renault. Tago Masashi, Production Director at the Żarów plant, believed in the success of the investment from the very beginning. - I remember when in 2004 a group of 11 workers came for training to the company seat in Takasaki. They were all young, enthusiastic and committed. I thought that if people like that were going to run the Polish factory, it was bound to be successful. As you can see, I wasn’t wrong – he says. When the company was beginning its activity in Żarów in 2004, four production lines were installed in the plant. This number has now increased to 20, and the company employs almost 180 people. On 11 April, YAGI celebrated the tenth anniversary of beginning production in the Wałbrzych Special Economic Zone. Among the guests invited to participate in the ceremony were representatives of the parent company’s board, presidents of YAGI’s business partners from Europe and Japan as well as President of the WSEZ “INVEST-PARK” Barbara Kaśnikowska and Mayor of Żarów Leszek Michalak. - More than 170 firms have already invested in the Wałbrzych Special Economic Zone, generating more than 40,000 jobs. Almost 40% of these companies represent the automotive industry. YAGI POLAND FACTORY is an important element of this economic system, and an important partner of the Zone. Moreover, the company’s involvement in the life of the local community of Żarów must be emphasised. We are proud to have such a reliable and trusted partner among us – Mrs. Kaśnikowska said during the ceremony. 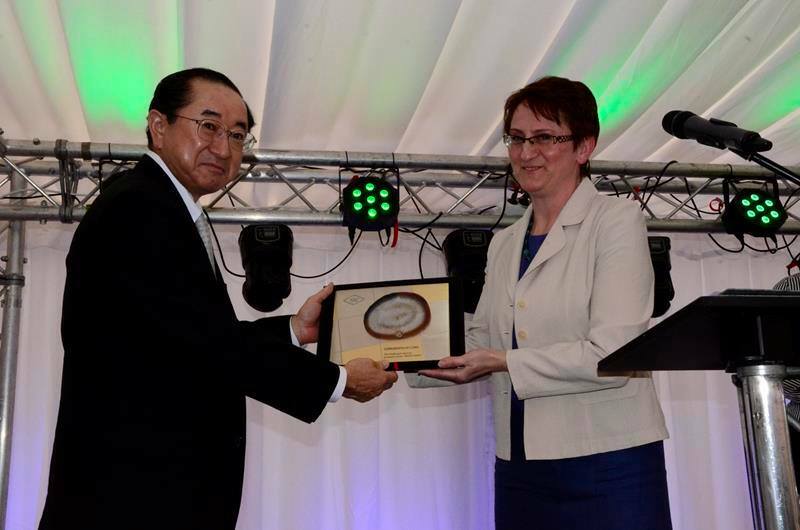 WSEZ “INVEST-PARK” President Barbara Kaśnikowska is presenting YAGI President Norihiro Yagi with a commemorative agate mined in Lower Silesian mountains.